Researchers at Montana State University and Brandenburg University of Applied Sciences in Germany have created a simple mathematical model based on optical measurements that explains the stunning colors of Yellowstone National Park’s hot springs and can visually recreate how they appeared years ago, before decades of tourists contaminated the pools with make-a-wish coins and other detritus. The model, and stunning pictures of the springs, appear today in the journal Applied Optics, which is published by The Optical Society (OSA). If Yellowstone National Park is a geothermal wonderland, Grand Prismatic Spring and its neighbors are the ebullient envoys, steaming in front of the camera and gracing the Internet with their ethereal beauty. While the basic physical phenomena that render these colorful delights have long been scientifically understood — they arise because of a complicated interplay of underwater vents and lawns of bacteria — no mathematical model existed that showed empirically how the physical and chemical variables of a pool relate to their optical factors and coalesce in the unique, stunning fashion that they do. “What we were able to show is that you really don’t have to get terribly complex – you can explain some very beautiful things with relatively simple models,” said Joseph Shaw, a professor at Montana State University and director of the university’s Optical Technology Center. Shaw, along with his Ph.D. student Paul Nugent and German colleague Michael Vollmer, co-authored the new paper. 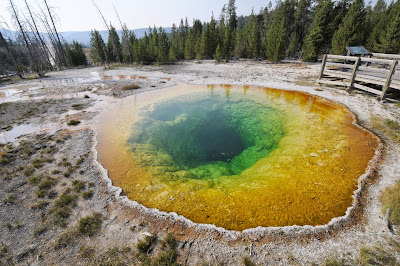 Using a relatively simple one-dimensional model for light propagation, the group was able to reproduce the brilliant colors and optical characteristics of Yellowstone National Park’s hot springs by accounting for each pool’s spectral reflection due to microbial mats, their optical absorption and scattering of water and the incident solar and diffuse skylight conditions present when measurements were taken. “When we started the study, it was clear we were just doing it for fun,” Vollmer said. But they quickly discovered there was very little in the scientific literature on the subject. That’s when things got interesting. Montana State University, in Bozeman, Mont., is a short drive away from Yellowstone National Park. In the summer of 2012, Vollmer, on sabbatical from the Brandenburg University of Applied Sciences, travelled with Shaw and Nugent to the park. Using handheld spectrometers, digital SLR cameras for visible images and long wave infrared thermal imaging cameras for non-contact measurement of the water temperatures, the group took measurements at a number of pools in Yellowstone, including Morning Glory Pool, Sapphire Pool and Grand Prismatic Spring. Using these data, along with previously available information about the physical dimensions of the pools, they were able to create a simple model whose renderings of the pools were strikingly similar to actual photographs. In the case of Morning Glory Pool, they were even able to simulate what the pool once looked like between the 1880s and 1940s, when its temperatures were significantly higher. During this time, its waters appeared a uniform deep blue. An accumulation of coins, trash and rocks over the intervening decades has partially obscured the underwater vent, lowering the pool’s overall temperature and shifting its appearance to a terrace of orange-yellow-green. This change from blue was demonstrated to result from the change in composition of the microbial mats, as a result of the lower water temperature. A general relationship between shallow water temperature (hence microbial mat composition) and observed colors was confirmed in this study. However, color patterns observed in deeper segments of the pool are caused more by absorption and scattering of light in the water. These characteristics – mats having greater effect on color in shallow water, and absorption and scattering winning out in the deeper areas – are consistent across all the measured pools. “Our paper describes a very simple, 1-dimensional model, that gives the first clue if you really want to do more,” Vollmer said. Future work for Nugent, Vollmer and Shaw includes delving further into infrared imaging at Yellowstone National Park. Note : The above story is based on materials provided by The Optical Society.